The unhappy events in the reign of Charles I., and the unsettled state of the country during the interregnum, were not without their effect upon Penzance. We learn something of this from the MSS. of Alexander Daniel (son of the before mentioned Richard Daniel, of Truro, who died 11th February, 1630), who, as he states in his diary, with his wife and family came to dwell at Penzance in Kate Colan’s house, on the 24th March, 1632; and after living in three different dwellings in the town—viz:—in John Friggens’ house in 1633, and in W. Noye’s house from 1634—he finally, in 1639, removed to Lariggan; where he busied himself about his farm, and ventured in a little merchandize. He appears to have devoted his leisure hours to writing meditations in rhyme (and there are extant no less than 374 of them, occupying 364 folio pages), as well as a sort of diary, which he entitles “Briefe Chronological Observations of and for mine own Familie, Myself, and Friends.” He also corresponded frequently with his cousins Whitmore, and others; but particularly with his eldest son Richard, who lived chiefly at Edmonton: to whom, for some unexplained reason, he had handed over a very considerable portion of his property, including the lordship of the manor of Alverton. Of those letters he fortunately kept copies, and wrote them, together with his meditations, diary, and accounts, into a large folio volume, which is still in the possession of one of his descendants, through whose courtesy I have been permitted to examine and make extracts from them. The letters and diary are especially interesting to us, as Penzance people, since they frequently allude to persons and places in the town itself, and enlighten us upon many subjects with regard to which history is deficient. His accounts, too, are not without interest; and the price of butter in those days—3d. per lb.—is enough to make the modern housewife’s mouth water. Several of these letters have been in part printed in Mr. Courtney’s excelent “Guide to Penzance;” and some of them bear particularly upon the state of the county during the troublous times of civil war. I may mention, in passing, that the whole of the MSS. are in a contracted hand, which might puzzle an ordinary nineteenth century reader. In 1646, this ever loyal Borough sympathised with the King, and consequently was plundered by the Parliamentary soldiers. Referring to this circumstance, Hals, in his Parochial History of Cornwall, says:—“This town of Penzance, A.D. 1646, in the time of the wars between King Charles I. and his parliament, for the kindness and charity the inhabitants showed to the Lord Goring’s and Lord Hopton’s troop of horse, driven into those parts by Sir Thomas Fairfax, the parliamentary General, was made a prey to his soldiers or troops; who for two days had the plunder of the town, and its inhabitants’ goods; to the one’s great loss, and the others great enriching: for one of the troopers, viz:—Edward Best, of St. Wenn, had to his share five gallons of English coin—silver and gold, and pieces of eight.” Some sixty years ago, a relic of this incident was to be seen in the Market place. Opposite the western end of the Market house there was an old door, in which were lodged some bullets, said to have been fired by the Parliamentary soldiers at some person who was endeavouring to escape into the house. Again, in May, 1648, Penzance made a fruitless attempt to assist the fallen King, which was speedily repressed; not, however, without the loss of life and further plundering. The most valuable part of the booty on this occasion appears to have been the Aldermen’s gowns, and feather beds; as we learn from the MS. of a certain Mr. Mundy, of Penryn, who was a eye witness of the scene,—and, therefore, I will give you his own words, as quoted by Mr. Courtney. He says:—“In June,7 1648, Penzance rose; to suppresse whom were sent certain companies (as I take it, under Colonel Bennett) who made short work, killed some, took some prisoners, scattered the rest, plundered the Towne (formerly, in Anno 1595, burnt by the Spaniards). The victors passed through our’s8 in a triumphant manner; viz:—first, three souldiers, bearing on the points of three swords (carried upright) three silver balls used in hurling; then followed other three souldiers, marching very gravely in Aldermen’s gownes; the souldiers marching after, with plundered ribbons and favours in their hats; ever and anon shooting off gunnes, seconded by a general shout and hallowing; then followed about 40 prisoners; and after them certaine horses laden with pillage, as feather beds, household stuff, &c.” He adds that they marched in this manner up and down Penryn till the triumph ended; when the prisoners were lodged in the Market house, and the soldiers repaired to their quarters. Philip Lanyon, of Penzance, served as Adjutant-General and Captain whilst any force remained in Cornwall. He was also, during the disturbances, plundered of £1000, his estate sequestered, and himself imprisoned. At the restoration, he petitioned Charles II. for what seems to have been the office of supervisor of workmen at all castles and forts throughout the kingdom; but it does not appear that he was successful. This is probably the Philip Lanyon who issued a token in Penzance, with the arms of the Borough on one side, and those of Lanyon on the other. He was Mayor in 1650. There are altogether five tokens known belonging to this town—all farthings, issued between 1663–67. The names of the other merchants whose names appear on these little coins are:—John Trevethan, Anthony Gubbs, John Blunt, and Ralph Beard. Exterior View of the Baptistry, near Madron Well. If all that is said of Peter Ceely be true he has much to answer for, and the bump of destructiveness must have been largely developed in his cranium. 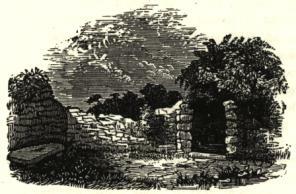 To him and his men is attributed much of the damage done to the churches, &c., in this neighbourhood in puritanical times; and he is said to have destroyed the little chapel or baptistry, some remains of which are still to be seen near Madron well—a well remarkable as a doom or wishing-well, and vouched for by Bishop Hall, the satirist, as being endowed with miraculous powers of healing. 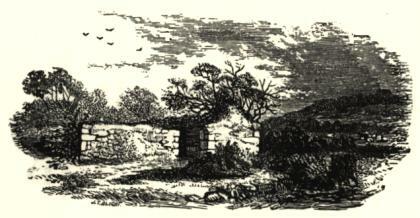 But this well, though no longer regarded with superstitious veneration (except among the few who will still drop pins therein, and perform certain rites on May-day morning), ought at least to be respected by Penzance people, since its overflow was, until recently—as it had been from time immemorial—the chief source of water supply to the town. Other streams now help to fill the reservoirs. In January, 1659, Penzance ventured to draw up a remonstrance to the Protector, as appears by the second book of the Borough Records. These records commence with the 5th October, 1655. The first book, unfortunately, is lost; it may possibly have been destroyed during the pillage of the town last alluded to. * Better times were at hand, however, and with an elasticity and activity for which it has ever been and is still remarkable, Penzance was soon prospering and flourishing again. Having suffered with the late King, as might have been expected, the town rejoices at the Restoration. Coronation expenses figure largely in the accounts of the Corporation: £1 was laid out in a boat burnt on this memorable occasion, and £14 10s. was spent in wine and beer at Mr. Veale’s—a large sum compared with the usual expenditure, and considering the value of money in those days. In the following year we learn from the same accounts that a fee present to His Majesty has been under consideration; and a petition is presented to the King for a Coinage charter, which was favourably received. Among incidental entries about this time there is, “for a gallon of burnt sack given Mr Buller,” who had lately sealed the lease of the Alms house, “10s;” also, “to young Mr. Randall, for his quarter’s preaching, £2 10s. !” and upon several other occasions, “a gallon of burnt sack for Mr. Buller, 10s.” Had it not been that payments for ministerial duties were frequently set down at a larger sum, it might be supposed that five gallons of burnt sack and a quarter’s preaching were considered equivalent in value at Penzance in those free and easy days. Soon another important entry catches the eye. “To Colonel Godolphin’s Clerk, for bringing home the Coinage Charter, £1.” This charter, dated 18th August, 1663, with a well executed portrait of Charles II., and the first line highly ornamented with doves, fruit, &c., endowed Penzance with all the privileges of a coinage town;—tin, not gold or silver, being operated upon; and I need scarcely tell Penzance people that coining is the act of striking off one of the coins or corners of a block of tin, for the purpose of assaying or testing its quality, before the payment of certain dues, and the stamping of the block with the seal of the Duchy. Coining of tin was continued here almost without interruption until the custom ceased in 1838, in consequence of the Duchy being compensated for these dues by an annuity paid out of the consolidated fund. Upon the granting of this charter the Corporation shortly built the Coinage hall, adjoining the Market house at the east end, on the waste ground there—concerning which Alexander Daniel, on the 5th January, 1663-4, writes to his son Richard, saying:—“Penzance men are about to build a coinage hall upon your wastrell of the street below their market house, which doth rightfully belong to you, as Lord of the Manor, and they have no right unto it, but by oppression and encroaching; you have the counterpart of my Father’s grant to the Town, and you know the place. You may examine the deed, and advise touching it. I have told to some of them they ought to compound and agree with you first, for that they had no right unto the waste land.” The corporation proceeded with their building, notwithstanding, and tin was coined on this spot for just one hundred and fifty years; but in 1816 it was found necessary to remove to more commodious premises, which were procured near the Quay, and are those now generally known by the name of the Triangular stores. The street which bounds the stores on the north-east retains the name of Coinage hall street. The Alms house formerly standing in Market-jew street was built about the same time as the first Coinage hall. The plague which ravaged London in 1665 is mentioned by Alexander Daniel in a letter to his cousin, William Whitmore, Esq. He says:—“Many families from London retired in our county, yet I have not heard of any one that died here of that disease.” In the same year the Mayor and Corporation obtained a licence from Bishop Ward for divine service to be performed in the chapel of St. Mary, which had remained in somewhat of a ruinous state from the time of its having been injured by the Spaniards (just seventy years before) until about this time, when it was repaired. Other additions were made at various times, and in 1667 a bell was set up in the steeple-crowned belfry, at a total cost of £12 18s. 6d. The bell itself cost £12 5s., and it now (since the modern church of St. Mary has been enriched with a peal of eight) does duty as an alarm bell at the Public Buildings. In 1670 two new silver maces were provided for the town, the same which are now in use, and these, together with carriage, cost £13 13s. 2d. I can only account for the fact of new maces being required, by the supposition that the town had been pillaged of the older ones at the time it was last plundered. The maces, then, now borne before the Worshipful the Mayor on state occasions, have been, from time to time, so carried for more than two hundred years. They are highly embossed with the fleur de lis of France, the rose of England, the thistle of Scotland, and the harp of Ireland,—each crowned,—and bear the Royal Arms of the time of Charles II. ; together with the inscription at the base, “Thomas Grosse, Maior, An. 1670,” and the Town Arms. Just two hundred years ago, too, New Street, which probably is one of the oldest streets in Penzance, is mentioned in the Borough accounts. There is an entry for repairing the way between it and the sea: for cauncing, carrying stone, &c., £5 19s 6d. I need not tell you that cauncing means paving with small stones. 4 Lysons’ Magna Britannia, vol. iii., p. 210. 6 Gentleman’s Magazine, 1826, vol. i., p. 131. 10 Buller’s Account of St. Just in Penwith, p. 75. * Borough Records. Although there is no regular statement of accounts previous to 1655, there is another book, which contains a number of minutes of the Corporation at various dates—the earliest appears to be 1621; but the book is very imperfect and little attention has been paid to the arrangement of the entries, some of which are of as recent a date as the middle of the last century.